Tomorrow’s classroom has arrived, and it’s an exciting place, filled with authentic problem-based learning experiences and tailored to the strengths and needs of individual students. The ultimate goal? To create lifelong learners prepared to thrive in a global economy. But the revolutionary teaching required to meet that goal demands adequate time and training. Unfortunately, since high-level conversations about transforming the classroom often focus on hardware and resources, budgetary allocations tend to follow suit–an effect that recently led some researchers to conclude that technology has had a negligible or negative impact on student performance. A more nuanced understanding would have attributed this lack of impact to inadequate professional development (PD), rather than to the use of technology per se. Just as one would not discount modern surgical technologies based on their use by physicians trained solely in conventional methods, so one must recognize that adequate PD is a necessary condition for the success of innovative educational technologies. Time has always been a challenge in education. To create an innovative classroom, teachers need it–time to plan lesson plans and gather appropriate resources, but also time to grow, time to learn from others in the field. Sufficient time is especially crucial to integrating technology and to instilling confidence in teachers–confidence both in a specific tool and in their own ability to use it effectively. According to a recent study, teachers believe in the power of high-quality edtech, but many feel woefully unprepared to use it themselves. As a result, simply dropping a set of iPads in a teacher’s lap will never foster mobile learning. To better accommodate teachers and their busy schedules, the latest trends in professional development are moving away from generally ineffective, all-day workshops and toward a “brew-your-own” PD experience. 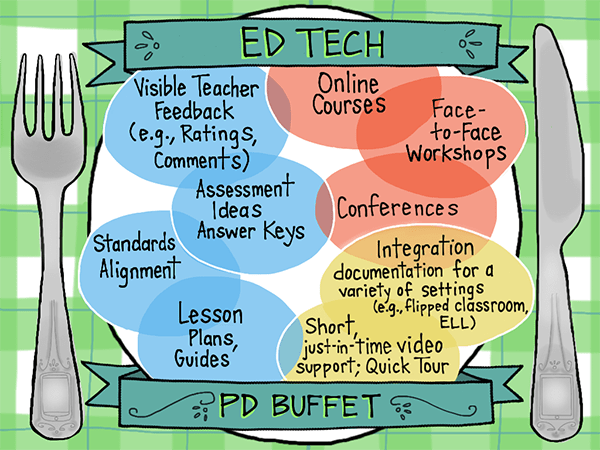 Through the wealth of knowledge disseminated online and tools for doing so, PD is moving toward tailored, self-paced experiences coupled with strong (and often virtual) professional learning networks that provide a community for sharing best practices, resources, and other materials. Today’s teachers want professional development that is directly relevant to their classroom, provided in small, bite-sized chunks, and available on their own hectic schedules. So how can educational technology developers accommodate a large-scale, personalized approach to professional development? We’ve talked a lot about leveraging SAS Curriculum Pathways to clear the hurdles that separate today’s classroom from the classroom of tomorrow. But mere possession of a tool does not make it useful. Untrained as a pilot, I cannot reduce my travel time to the next Alabama football game by simply replacing my car with a jet. And if I climb into the cockpit, teachers wouldn’t want their students to travel with me. Without quality PD, all the solutions we’ve discussed in previous posts are the educational equivalent of jets without pilots. Great potential. Brilliant engineering. Zero impact. There are a number of ways to change that equation. At SAS Curriculum Pathways, our approach has been to offer PD for our resources in various flexible formats so teachers can choose what works best for them. And thanks to the generous backing of our CEO, we provide both the resources and the PD for free. From support materials to full-fledged courses, we strive to meet the demands of our diverse user base. In addition, our offerings meet teachers right where they already are: in the classroom, at local, state, national, and international conferences, and, more frequently, online! Exploring SAS Curriculum Pathways provides a quick, hands-on introduction to our product. Getting Started with SAS Curriculum Pathways is an exploratory course tailored to a participant’s grade level and/or discipline; the course concludes with the relevant task of creating and executing lesson plans while our PD specialists provide individualized feedback. Building Unit Plans with SAS Curriculum Pathways extends our Getting Started course, guiding participants as they build larger, long-term plans using our resources. Since live classroom integration is not required for this course, it can be taken at any point in the calendar year and is very popular in the summer. Again, our PD specialists provide individualized feedback. Targeting Instructional Outcomes with SAS Curriculum Pathways explores models of effective integration and guidance while participants are planning and implementing in real time. Included in our online offerings is the Master Teacher Collaborative. After completing at least two of the courses listed above, teachers are invited to participate in this training. Program participants network with like-minded educators, develop instructional plans with support and feedback, build their professional portfolios, and help develop new digital resources. Experience has shown that our Master Teachers are talented, forward-thinking educators. A partial list of our Master Teachers and those in training appears below. By following these educators, you’ll receive astute guidance and practical knowledge sharing. Our trained team of professional development specialists also provide face-to-face PD at schools, conferences, and universities (pre-service teachers). And we partner with larger professional development organizations, including NYIT, Gear Up Tennessee, Gear UP North Carolina, and Batelle for Kids. Quick, on-demand information is also available for PD and integration tips on the fly. Whether an educator has a minute or an hour, these documents, videos, white papers, and interactive tools are embedded all over our website. For users wondering what “a week in the life” of a teacher who uses SAS Curriculum Pathways could look like, we offer animated plan books filled with ideas on how to tailor our flexible resources to the needs of teachers. Our lesson guides identify objectives, materials, procedures, and assessment (if applicable). Each of our resources is aligned to state standards. Teachers can either search our database by a specific standard or view the standards associated with an individual resource. To help users browse our large repository, teachers are encouraged to provide a star rating and comment on their classroom experience with each resource. Students are also able to “like” resources of their choosing. We’re confident that a broad-based PD effort like the one described above can transform the potential power of high-quality edtech into actual improvements in student learning, Nothing is better for student performance than a well-trained, highly-effective teacher. And we are here to help. Previous articleHow Will Machine Learning Impact Your Life?